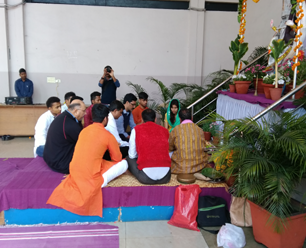 On the auspicious day of Saraswati Puja, the students, faculty and staff of OP Jindal University, came together to seek the blessings of the goddess of knowledge. OPJU has celebrated the puja with same fervor as it celebrated different festivals with. Believers as well as non-believers, all came together under one roof to celebrate this festival. 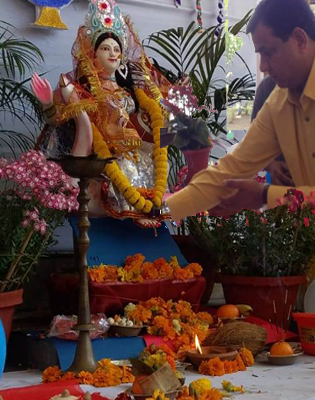 Saraswati Puja is a popular festival of students. These celebrations at campus ensure that students find a home away from home. 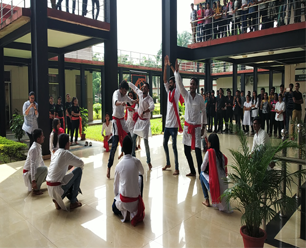 Both the faculty and students joined hands together, with great zeal to make the event a memorable one also evoking the blessing of the goddess of knowledge to have a successful academic and carrier growth. The rituals were conducted by Pandit ji, who not only performed the Pooja but also enlightened on the concept of worshiping Goddess of knowledge, ending the event by serving prasad to everyone present. School of Management organized an Industrial Trip to Singapore for Students of MBA (3rd Sem) (Sponsored) from 10th Jan to 14th Jan 2019. Students learned management aspects of business through company visits and cross-cultural aspects between nations. It helped to generate strong bonding between them to work as a team. Students visited two companies - 1) Rex Precision - helped to learn entrepreneurial aspects, how to manage business operations and understanding of cross-cultural aspects of the business. 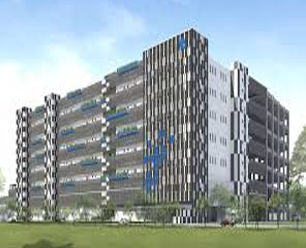 2) Surbana Jurong - A 300 billion US dollar company was an excellent opportunity to visit as students learned about the new technologies in the planning of infrastructural development for industries, housing projects, smart cities etc. They are executing projects in various parts of the world including India. School of Management organized an outbound training programme for MBA & BBA students at Delhi & Nainital, from 13th November – 21st November, 2018. During their training programme students visited Parle-G factory in Rudrapur, Pantnagar, where they got an opportunity to look closely at the working of factory and manufacturing of Parle-G biscuits. They also visited Tata Motors plant at Pantnagar, where the best selling Tata Ace- the mini one tonne truck and its variants are manufactured. As part of their adventurous activities, students visited Jim Corbett National Park in Uttarakhand. The students had a great learning experience and OPJU is looking for more such events in future. 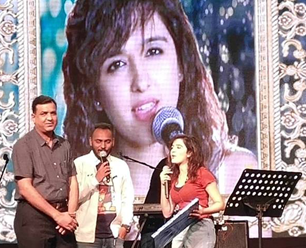 OP Jindal University has organized a live performance of the "millennial singing queen" Shirley Setia at JUnoon '18 - Annual Cultural Fest in the evening of Oct 25, 2018. The fest also witnessed India's most famous DJ, Nikhil Sahni popularly known as “DJ NYK” showcased EDM skills with his limitless beats on Oct 26, 2018. OPJU REPRESENTATION AT MATDATA JYOTI DAUD (SVEEP MASHAL PROGRAMME), ORGANIZED BY THE GOVERNMENT OF CHHATTISGARH. 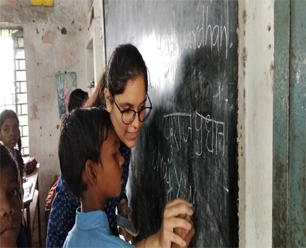 In order to create awareness in urban areas, the Government of Chhattisgarh, organized a Matdata Jyoti Daud (SVEEP MASHAL PROGRAMME) on 11th October, 2018. The objective behind the event was to encourage the new voters to participate in the democratic election by casting vote, which is their fundamental right. OPJU enthusiastically participated in the event by organizing the rally from Dhimrapurchowk to Raigarh stadium. 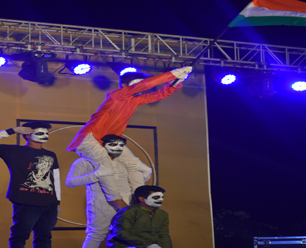 Their contribution was quite appreciated by the Raigarh Authority and the students turned up in large numbers. The Techno Club has successfully completed its Android Awareness Programme on 18th September, 2018. 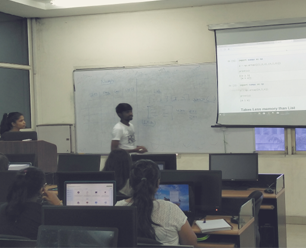 Students from different branches participated in the session conducted by Rishav Kumar and Vishwajeet Thakur of CSE 7 Semester. Cultural Club, OPJU under the leadership of Lovely Singh and Sakshi Agrawal successfully organised Ganesh Pujotsav. During Pujotsav various cultural Programs like *Ethinic Day, Dance Competition, Bhajan Sandhya* were organised. Social Empowerment Club And National Service Scheme Organized A "Dengue Prevention & Awareness Drive"
Social Empowerment club along with National service scheme (NSS), organized a “Dengue Prevention & Awareness Drive” in Tumidhi Village on 12th September, 2018. The drive was initiated by members of NSS & Social Empowerment club along with the First year students. The volunteers were welcomed by the Village people with open arms. The members of the club made the students & Adults aware of Dengue, its symptoms and various preventive measures, with the help of some activities. The people of Tumidhi village not only learned about the Dengue Prevention but also enjoyed a lot with the volunteers and showed up at large. Overall it was a great experience and learning for all of them. Social Empowerment Club and NSS, OPJU organised a "General Education Drive" in the Govt. Middle Schools at near by Village, where the members of the club organised various educational and fun activities like origami, puzzle, GK Quiz for the students.The members also gave information regarding the basic of Computer, smart phones and various new electronic gadgets to the students and faculties of the school that can help them to improve their teaching methodology. 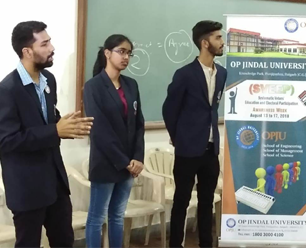 SOCIAL EMPOWERMENT CLUB organized Quiz and Nukkad Natak Competition at OPJU Campus under the Systematic Voters Educational and Electoral Participation to make awareness for voting. A Workshop on “Machine Learning using Python” is being organized by Techno club and will be completed by 16th November 2018 under the Leadership of OPJU students Rishav Kumar, Rahul Kuma,Ravi Rathore ,Manas Das,Sakshi Agrawal,Megha. SVEEP is a programme of multi interventions through different modes and media designed to educate citizens, electors and voters about the electoral process in order to increase their awareness and participation in the electoral processes. 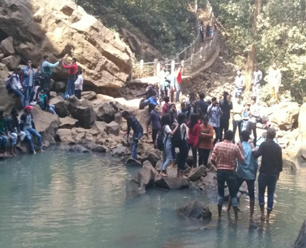 A group of engineering students of OPJU visited Pachmarhi.PACHMARHI in M.P. popularly known as ‘Satpura Ki Rani’ (Queen of Satpura), is famous tourist retreat having a rich and rare flora and fauna, beautifully embellished by nature and history, a treasure with ancient caves of Buddhist era residing in harmony with serene waterfalls surrounded by Satpura Range. The beautiful region is also famous for its Silver falls, Apsara Vihar, Rich Biosphere, Dhupgarh etc. It is listed in UNESCO Biosphere Reserve in 2009 for its garden grass.This visit allows them to understand our past memorabilia and also provides the students with insignt into our cultures of origin as well as cultures. The Technorollix’18 is to bring together dynamic, innovative and enterprising students of various colleges from all over India on a common platform to participate in different competitive events ranging from innovative models, technical papers, Quizes, Robo Race, Aqua Hunt, Junkuard, Funyard, showcase, Street Play, LAN games, AD MAD, Master Chef, Fun Adventure, Corporate Game, Cultural night, and many more along with students. Adventure Club OPJU organised a one day Trip to Mainpat (known as Shimla of Chhattisgarh). 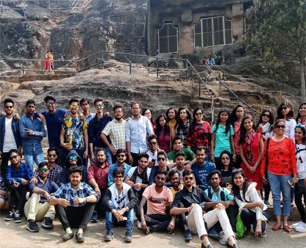 The student had great learning experience where students visited various tourist spots in Mainpat including the Dhakpo Monastery which is the only Tibetian settlement in Central India. 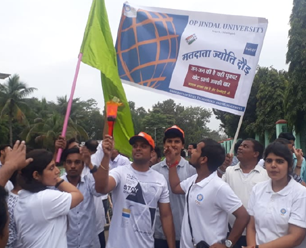 It was a completely student-driven activity where the students of SOE and SOM showed great enthusiasm and participation. 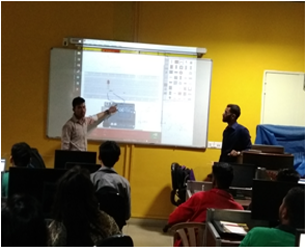 Technical Club, OPJU organised 3 days Internal workshop on the topic "Introduction to Arduino". 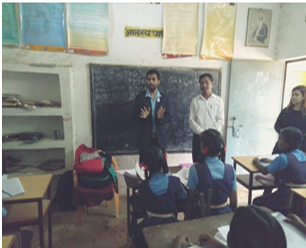 It was a complete student-oriented workshop that was organised by students and guided by students as well. This workshop was followed by a two days external Workshop on the Topic "Introduction to IOT". 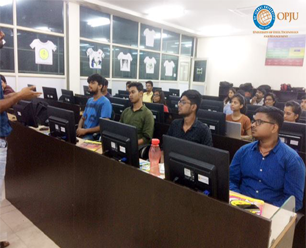 The workshop was organised in Association with ELAN and nVision IIT Hyderabad.The objective of this workshop was to boost technical skills of students and to create awareness about trending technologies like Artificial Intelligence and Machine Learning among students. Rishav Kumar , Rahul Jaiswal, Anshu Ranjan And Saptrishi. Vasant Panchami is celebrated every year on the fifth day of the Indian month of Magh (Spring Season). With great enthusiasm, Vasant Panchami was celebrated at OPJU University. 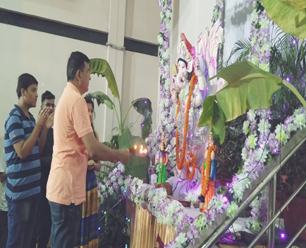 Saraswati Puja was organized by members of the club – The Cultural Club with full vivacity and festivity to mark the end of the winters. Lovely Singh,Rupesh Kashyap, Aditya Amboli,Shivam. 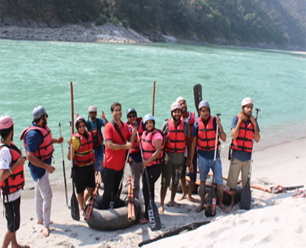 The School of Management, OPJU had organized an outbound Adventure Trip for MBA & BBA students to Rishikesh (Uttarakhand) from 5th to 11th Nov 2017. 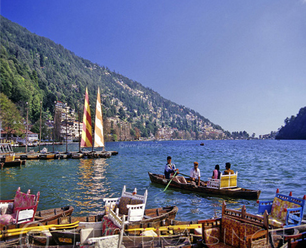 Students stayed at Camps near River Ganga. Various management games were conducted for the students by specialized trainers and the students also enjoyed various types of adventurous activities like cliff jumping, rappelling and river rafting. They had a great learning experience and build critical team building and collaboration skills.